The Stanley Cup had been awarded since 1893 to the top hockey team in the Dominion of Canada. In 1914, with the inclusion of the Pacific Coast Hockey League in the competition for the cup, a U.S. team (i.e. Portland) first became eligible. In 1916 the Portland Uncle Sams (aka Rosebuds) were the first American team to compete in the cup final, losing 2-1 in the final match of a 5 game series to the Montreal Canadiens on March 30, 1916. The contest was hard fought and spirited and in the last period the rival teams skated like mad men and the big crowd was kept in an uproar, especially after Dunderdale, of Portland, had shot the goal which brought the score to a one-to-one tie. The series was hard fought throughout and even the most ardent Eastern fans admitted tonight that Montreal had shown little if any superiority over the clever skaters from the Pacific Coast. Each team had won two games and tonight’s game, played under National Hockey Association rules, an advantage to the locals, was the deciding factor. 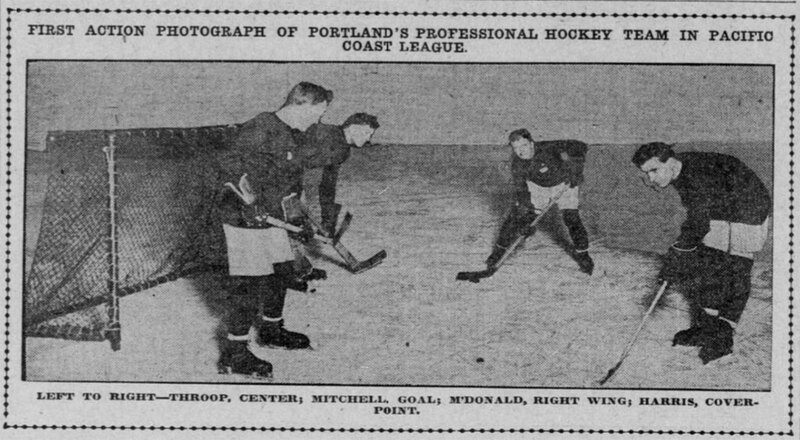 Portland’s professional hockey team was purchased from New Westminster in 1914 (The Oregonian, 23-October-1914), and played and practiced at the Ice Hippodrome at NW 20th and Marshall (Ibid., 26-November-1914). The team played their first game (which they lost 6-3 to Vancouver B.C.) on December 8, 1914 (Ibid., 9-December-1914). The Oregonian usually referred to the team as the Portland Uncle Sams, and used that name in box scores and lineup listings, but occasionally also mentioned their alternate nickname, Rosebuds. a boxing belt on the line during the prelim series themselves. Well Portland eliminated the defending champion Vancouver Millionaires and gained possession of the cup. Now this was the first year that the cup did not officially change hands by simply beating the champions but by winning the overall playoff. So the NHL does not consider Portland a past champion. But I would argue at the very least they were an Interim Holder of the cup stewards if you will. Thanks! I’ve updated the image in the post.